Customized Facial Customized to your current skin condition: Anti-aging, Purifying, Hydrating or Brightening. That is the most basic facial that can grown into more advance procedure based on your needs and desires. If you are not sure about the facial type, don’t worry, our skilled Estheticians will help you choose the right treatment based on the current skin condition. Micro-current Lifting Facial Alternative to BOTOX. Best for aged, mature and sagging skin. Your face contour will be visibly lifted just after one treatment. Micro-current delivers tiny electrical impulses that mirror the body’s own natural bio electrical field to lift and re-educate muscles with just a slight electrical tingling sensation. When a muscle lengthens or shortens, the skin lifts and firms. LED Anti-Aging Facial Best for acne, anti-aging and pigmentation. Red light LED stimulates the fibroblasts to produce collagen, that will give plump look and minimize wrinkles and lines. Blue light LED works by killing the bacteria deep in the skin that is responsible for acne. Our machine is the only one on the market that received 7 different FDA clearances. LED treatment is soothing and very relaxing. You can choose between LED Facial and LED Facial w/microderm for more drastic results. 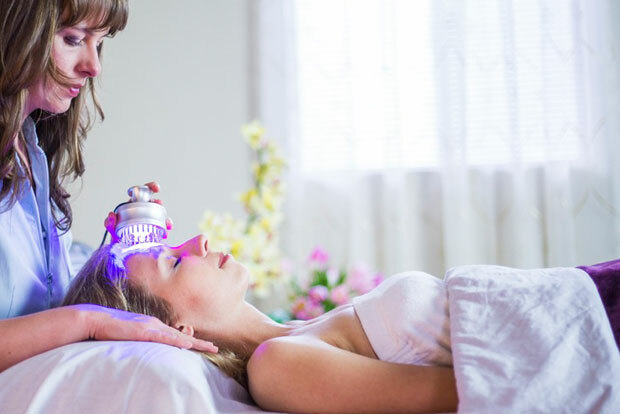 LED Facial w/microderm includes 2 types of exfoliations: microdermabrasion to remove dull layers, a customized fruit based peel to lift the dead skin, follow with vitamin-rich serums, a hydrating mask, and LED therapy treatment. Microdermabrassion Best for mature skin, pigmentation, acne scars, raised scar tissue, fine lines, sun damage and enlarged pores. It’s safe, non-surgical, pain-less procedure and your skin will look glowing and refreshed immediately after the treatment. Includes extractions. Our microderm uses the diamond tip and vacuum suction to remove dead skin to increase cell turn over and stimulate collagen production. Performed frequently micro-dermabrasion can be a great acne and pigmentation treatment because it helps to eliminate blackheads, discoloration and oiliness. (Micro-current + LED + Peel + Microdermabrasion) Have it all in one facial! Our client's favorite facial. First, Diamond microdermabrasion removes dull layers and an enzyme peel prepares your skin for extractions. Than we follow with micro-current to lift face muscles, apply anti-aging mask, massage your neck/shoulder/arms and finish with LED light therapy to stimulate collagen production. Bali Fruits & Flowers Facial Originated in Paris, France. Great option for sensitive skin. 5 Flowers Illuminescence Facial Originated in Paris, France. Great option for sensitive skin. Express Facial Created specifically for people on the go. Designed to give maximum results in minimum time, focuses primarily on cleansing and correcting. Back Facial Not ready to wear a tank top? Reveal smoother skin within 45min. Gentleman’s Facial Specifically targeting men who's skin suffers from city pollution, business travel or lack of sleep (which can cause dull, lifeless skin). Deep pore cleanse and purifying facial with relaxing steam, exfoliation, extractions (if needed), hydration masks to relive shaving irritation followed with antioxidants and peptides serums. All finished with with neck, shoulder and scalp massage. Includes post consultation for at home skin care products to maintain healthy skin.